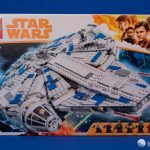 The largest set in the first wave of LEGO Star Wars sets from Solo: A Star Wars Story is 75212 Kessel Run Millennium Falcon at 1,414 pieces for $169.99. 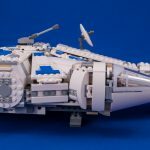 The set depicts an earlier incarnation of Han Solo’s iconic freighter, long before he made extensive modifications and upgrades to it in the years leading up to its appearance in A New Hope. 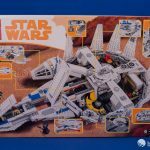 The box is no larger than any other LEGO Star Wars set in the $100+ range, despite several hundred additional pieces compared to the previous Falcon. 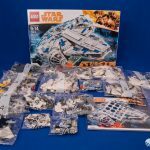 Parts are in ten sets of numbered bags, with an unnumbered bag of larger pieces and the instruction booklet and sticker sheet in its own sleeve. 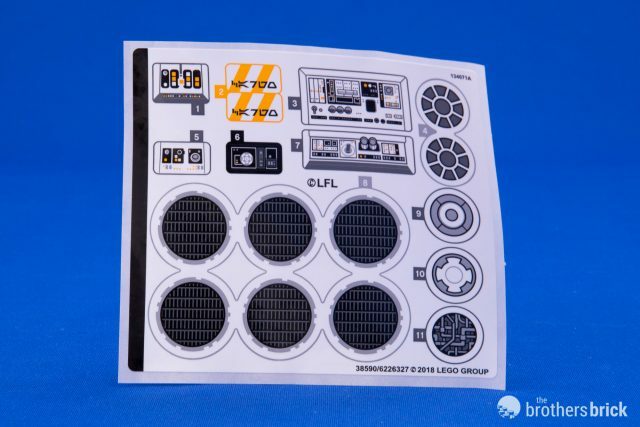 Unlike the three previous sets from Solo that we’ve already reviewed, this set does have a sticker sheet, with very few printed parts in the set. 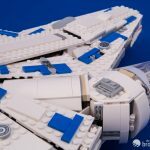 The basic structure of the factory-new Falcon is essentially the same as the TFA Falcon released in 2015, with a lattice of Technic beams sandwiched between plates lending significant sturdiness to the hull that sits atop that sub-structure. 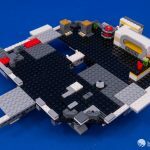 The first bag includes the parts for the ship’s base, while the second bag begins adding some of the interior detail, like a sleeping berth and the seating area with a dejarik holo-chess table. 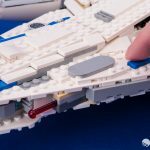 The third bag includes the parts for the remainder of the interior structure, completing most of the central laser turret shaft, boxy sections that fill in the area where the escape pods would be, the attachments for the front mandibles, and so on. 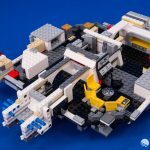 Bag 4 includes more structural elements, along with the first sub-assemblies for sections of the curved outer hull along the sides. 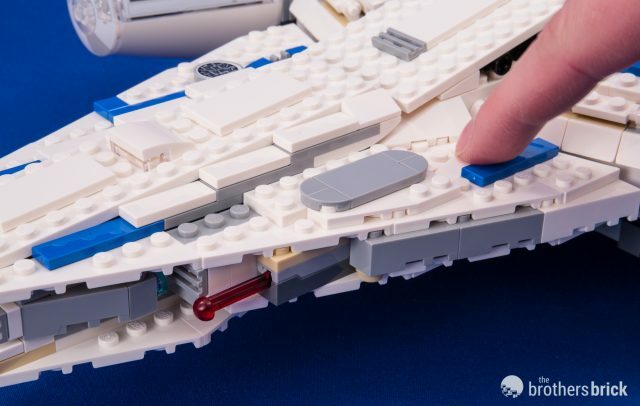 These attach with clips to the previously built hull structure, and represent the first “floating” sections not directly connected via studs to the core body of the Falcon. 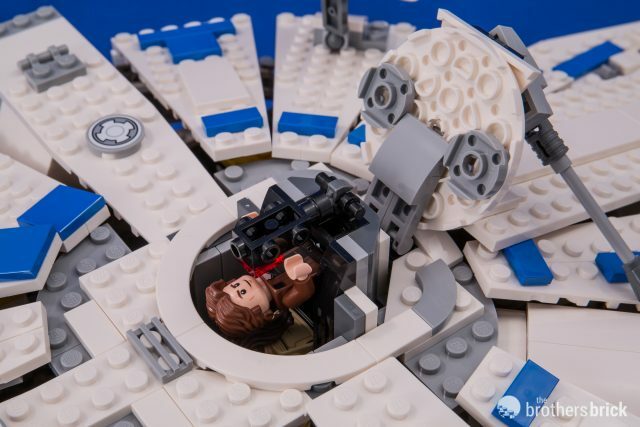 Bag 5 continues with more sections of the Falcon’s side, completing the circle. 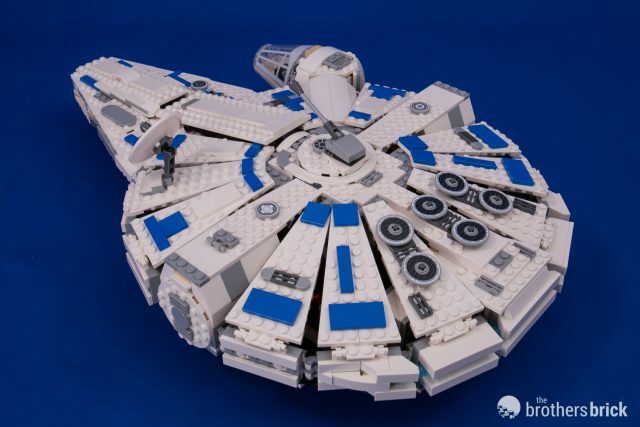 The Millennium Falcon finally starts taking recognizable shape with the next couple of bags. 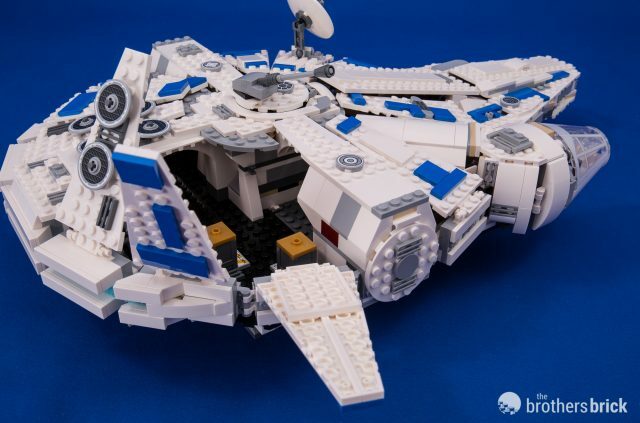 The sixth bag completes the lateral escape pod sections on either side of the Falcon, while the seventh bag adds the first curved sections of the asymmetrically projecting cockpit. 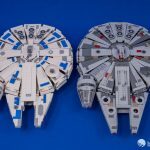 Subsequent bags add wedge plate after wedge plate to complete the sections of the upper hull — essentially identical to the construction techniques used to build every minifigure-scale LEGO Falcon over the past decade other than the UCS Millennium Falcon released last year. 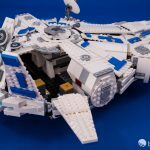 The ninth bag adds the front mandibles, and the Falcon is essentially complete, closely resembling previous LEGO Falcons — but in bright white and blue. The tenth bag adds the pod that fits between the mandibles. 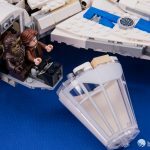 We assume it’s a cargo pod, but its precise purpose remains to be confirmed by the movie and forthcoming reference books. 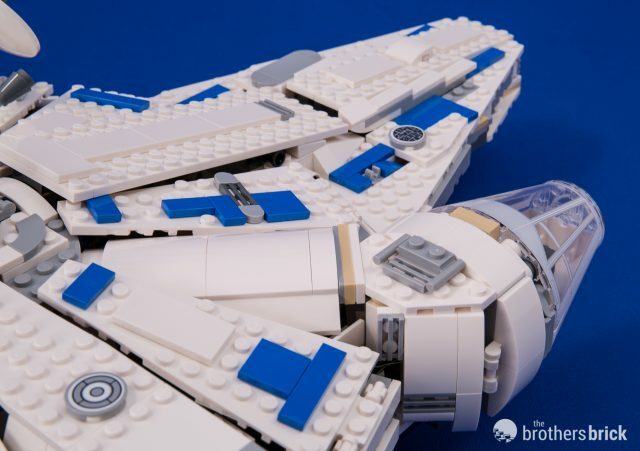 The underside of the completed Falcon has four small landing gear that hold the hull steady on a flat surface, keeping the lower laser cannon safe. 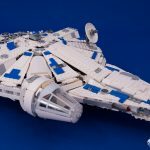 The “classic” Falcon has five landing gear, so it remains to be seen whether this is a LEGO design shortcut (as with some previous versions) or a difference between the Solo movie Falcon and Han’s customized version in later films. 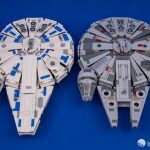 At first glance, this latest LEGO Millennium Falcon (it’s going to be hard to keep track of these Falcon versions, since I suppose it’s technically the “original” version now…) looks essentially like a recolored version of the 2015 Falcon from The Force Awakens, with the addition of a cargo/escape pod between the front mandibles. Structurally, that’s largely true, though nearly all of the actual details are different. Of course, the most noticeable difference is that this version isn’t grey. 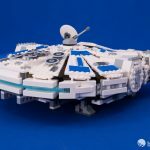 Shiny new and sporting blue highlights, this version isn’t the weathered, beat-up ship from the “lived-in” universe of the original trilogy. 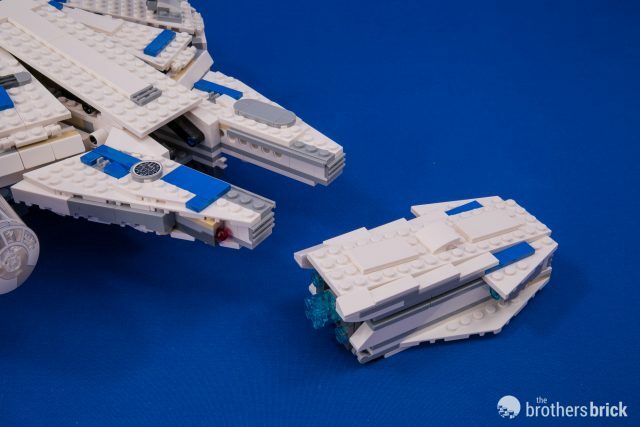 The next most obvious difference is the way the cargo pod docks between the front mandibles. 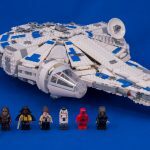 It’s been Star Wars lore forever that the Falcon’s mandibles are intended to hold a cargo container, but until now it’s never been canon (and we still don’t know if it’s strictly a “cargo” pod, especially given the fact that it seems to have life support, and possibly piloting capabilities). 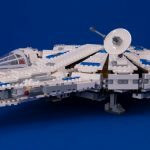 Unlike most of the previous imaginings of what a container here would look like, this one smoothly finishes the angles of the mandibles, giving the Falcon an arrowhead prow. The cargo/escape pod slides along rails and is attached at the back with a pair of clips, holding it snugly in place. 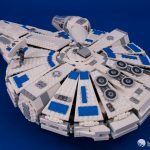 It’s a cool feature, especially because it’s great to finally be able to see what the Falcon can carry. Just like the previous version, each mandible houses a spring-loaded dart shooter. The buttons for these are exceptionally well hidden, and if you didn’t know where they were, you could spend a long time looking for their release mechanisms. As always, the darts provide a perfect dart-sized amount of fun that’s directly proportional to your ability to annoy those in your vicinity. 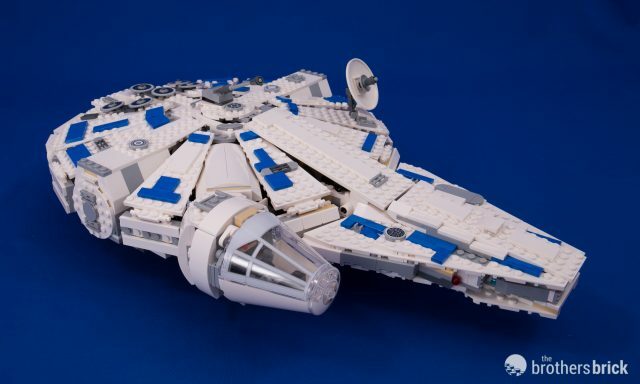 The rear engines are created with a strip of trans-blue tubing, a technique that’s appeared in most Falcon versions. 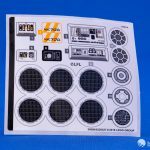 The six heat exhaust vents arranged on the rear hull are made with flat Technic disks, each carefully stickered with a donut-shaped decal. 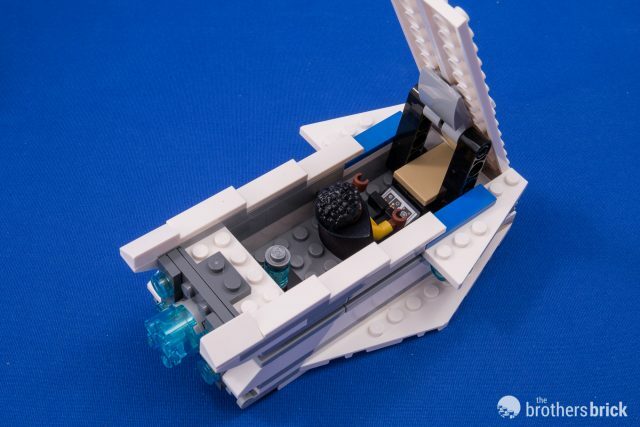 The cockpit is cleverly connected to the body with a hallway angled at 45 degrees. 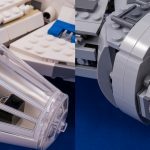 It’s not a perfect enclosure, as angled cylinders are notoriously difficult to achieve with LEGO, but it’s a very good approximation for the cockpit access corridor. 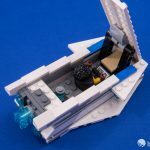 Unfortunately, the internal structure fills up what should be hallway, so there’s no actual access between the cockpit and the rest of the ship’s interior. 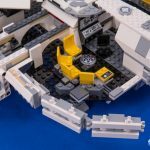 The shaping behind the cockpit is nearly perfectly round, thanks to curved slope bricks. 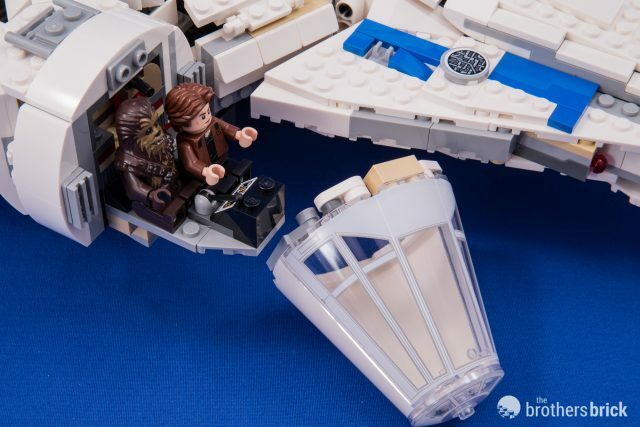 Han and Chewie had better be good buddies in this new film, because the cockpit is incredibly cramped, with just barely enough room for both minifigures to side-by-side, with Chewie staggered back by one stud. The cockpit can be accessed by sliding off the entire front canopy and underside, leaving the helm exposed on a spit jutting out from the corridor. 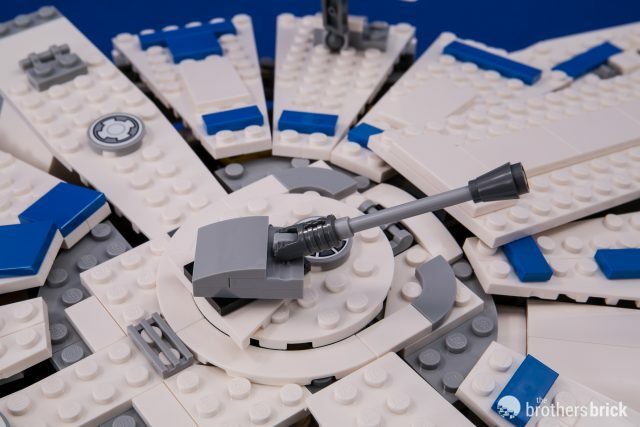 Up top, there’s a single laser cannon on a turret, with a matching one below. 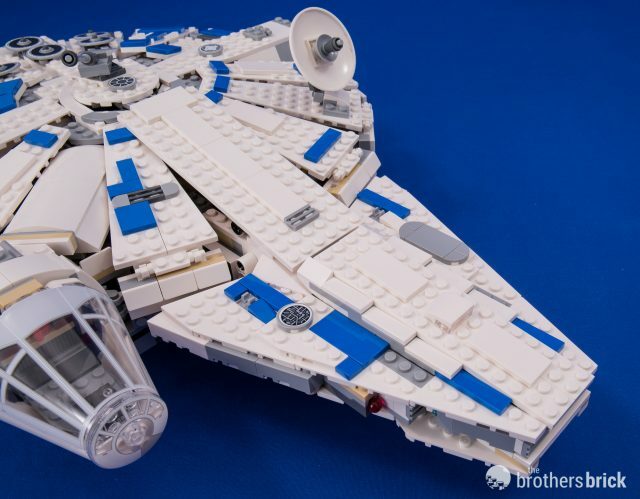 We estimate that this is approximately 25 percent of the firepower that Han Solo prefers on his ships. 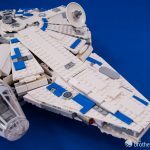 Due to the scale of this Falcon, the window just forward of the turret is a sticker on a 2×2 round tile (unlike the UCS Millennium Falcon, which is large enough to accommodate an actual window). The turret and window together are mounted a 6×6 round plate, which swings up as a hatch to provide access to the gunnery pod. 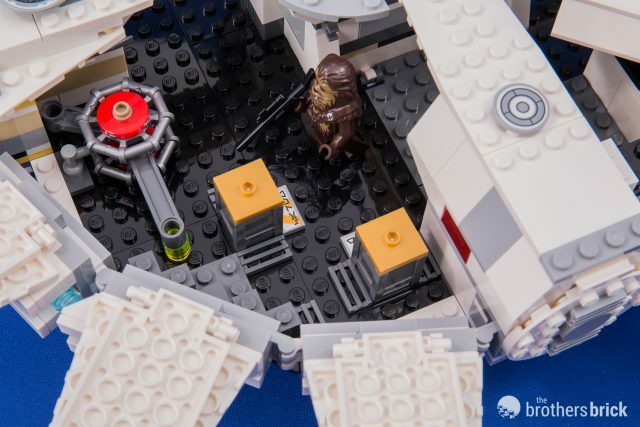 In the on-screen Falcon, this area is a vertical shaft with ladders leading to the top and bottom laser cannon turrets, but here it’s a removable pod that seats both gunners, with small targeting computers (a simple red 1×1 tile) for each. The pod slides in quite firmly, and doesn’t have anything to distinguish the top or bottom, so it can be inserted in either orientation. 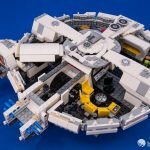 The bottom of the ship does not have an access hatch for removing the pod. 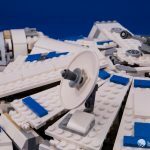 The Falcon’s radar dish seems to be the indicator for each version, as it changes with every new iteration. 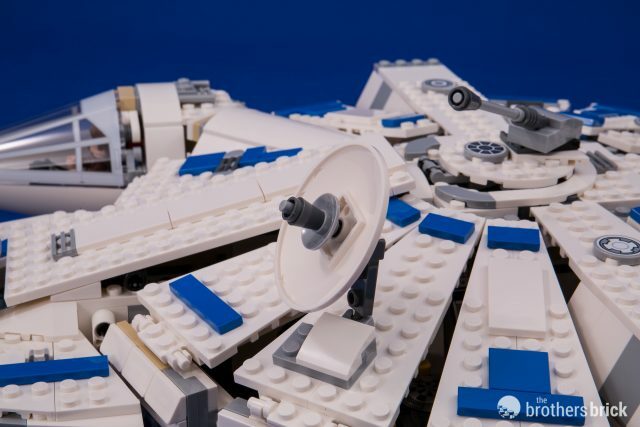 On this precursor Falcon, the dish lacks any decorations and sports a smaller dish in the center. 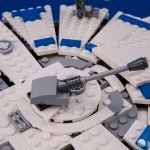 While the Falcon’s dish has always had a small nub in the center, it looks larger in what we’ve seen of the new on-screen version. 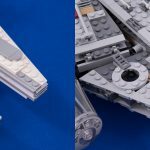 The dish is also mounted on a double-hinged arm with a pair of ball joints, allowing it to lay flat against the hull, pointing up. Except for the four cardinal directions and the cockpit access corridor, each of the hull’s angled panels lifts open. They’re mounted on standard clips, and they are firm enough that the ship is unlikely to spring open if it’s turned upside down. A full dozen individual panels unfold a bit like a flower, giving near full access to the interior. The panels sometimes catch on one another a little, but with minor adjustments they all nestle in nicely. The interior comprises three main sections. 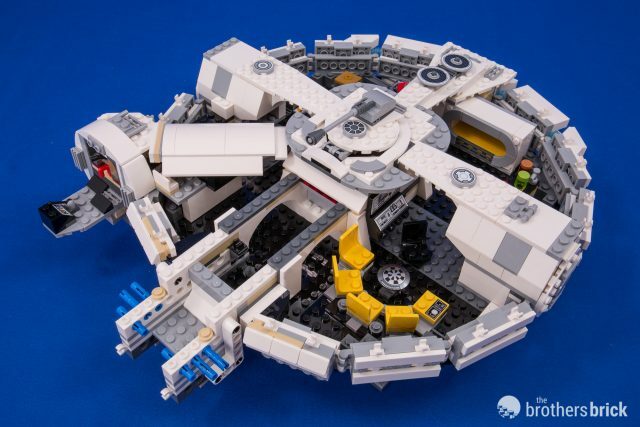 The engine room and cargo area is in the ship’s back right quadrant. 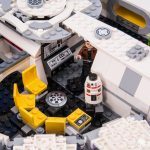 It features a bit of the hyperdrive core and several attachment points for cargo boxes, which are cleverly labeled in Aurebesh that reads “cargo,” giving us no insight into what Han or Lando are up to in this film. 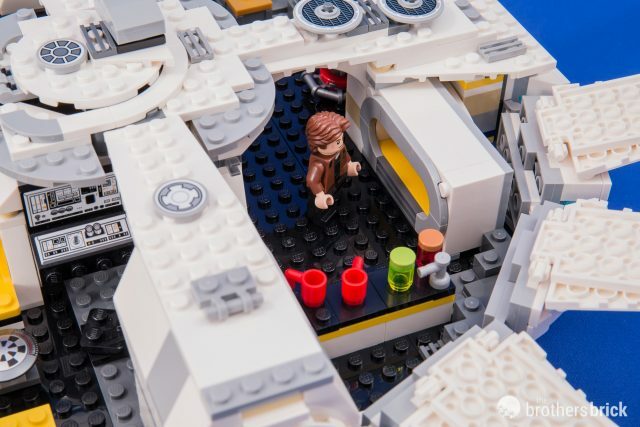 In the back left quadrant, the Falcon’s galley is equipped small bar and a variety of brightly colored drinks. There’s also a yellow berth compartment against the outer wall. 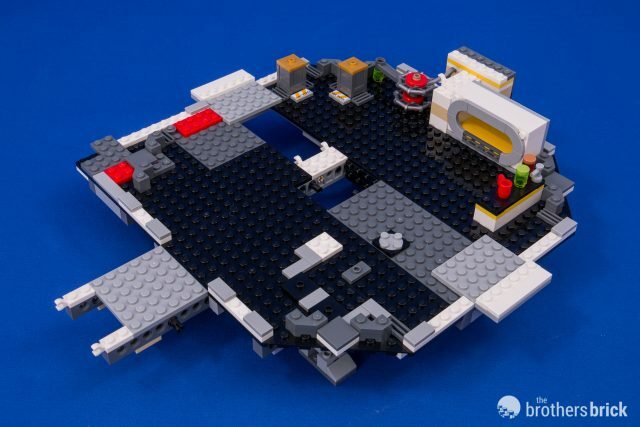 The front left quadrant will be familiar to any Star Wars fan, as it features the main hold, with a lounge, dejarik board, and engineering station. 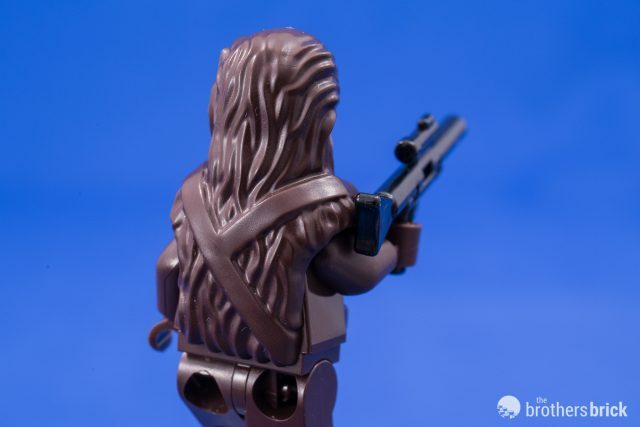 Let’s hope Lando knows to let the Wookie win—or maybe that’s how Han got the Falcon? 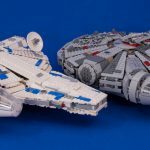 As we mentioned at the outset, this Falcon bears a strong resemblance to 2015’s 75105 Millennium Falcon, which itself is remarkably similar to 2011’s 7965 Millennium Falcon. 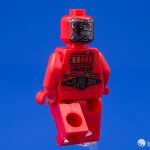 We dug out our copy of 75105 from our review of that set, so let’s see how they different they really are. 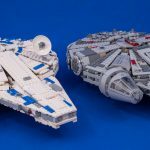 Dimensionally, the two ships are nearly identical, although one of the most interesting differences is that the grey Falcon adds a single 1×6 tile at the base of each hull panel, making all the panels sit very subtly different. Interestingly, the biggest difference is the mandibles. 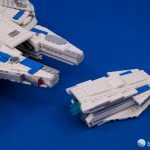 While you might expect that the white Falcon simply adds the pod between the mandibles, the white Falcon actually has a completely redesigned front. 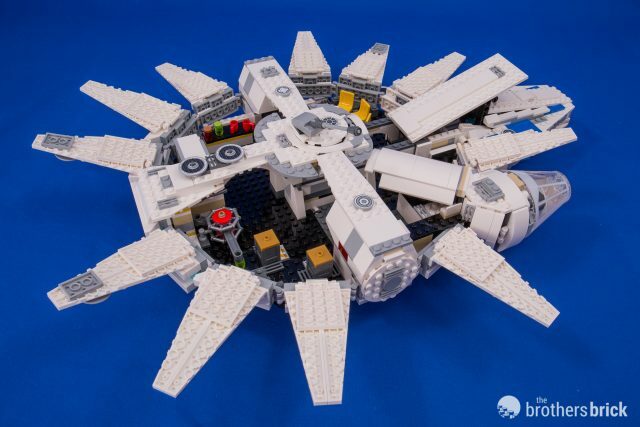 This results in much smaller mandibles, which is almost certainly attributable to LEGO’s interpretation and not an actual difference in the source material. 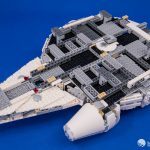 While both versions feature rails on the inside of the mandibles, the grey Falcon has a double set as decorative elements, not designed with the pod in mind. 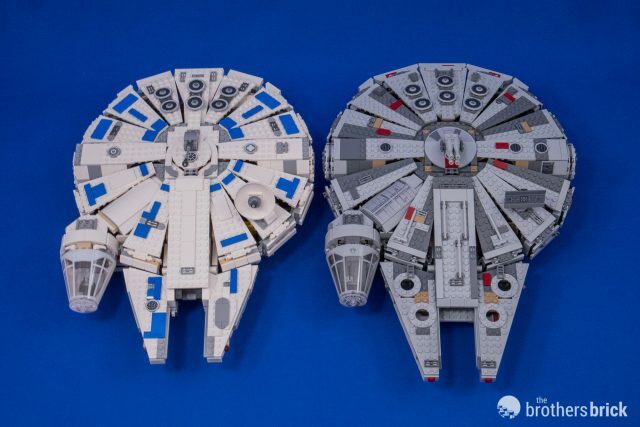 However, it would be trivial to adapt the grey Falcon to fit a cargo pod. 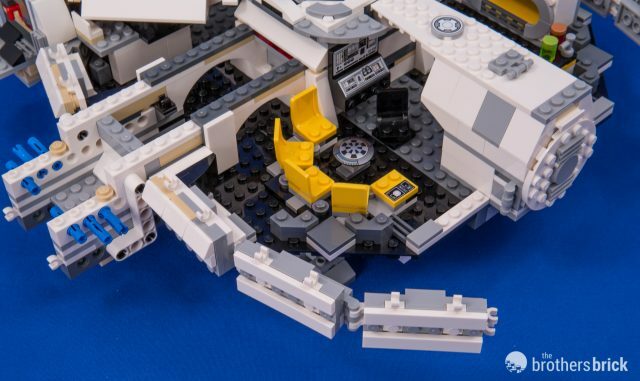 Another interesting feature is that the four round maintenance access bays on the mandibles, which have long been a prominent feature of the Millennium Falcon, presumably still have their covers on Lando’s version, because they don’t appear at all. 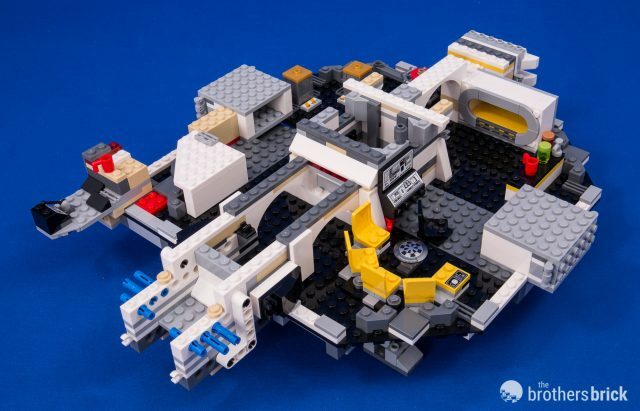 The canopy is one area where the LEGO design has simply improved as a result of new elements being available rather than a change in source material. The unsightly gap between the cockpit windscreen and the adjoining corridor in the old version has been filled in this updated design thanks to new 1×2 rounded plates. 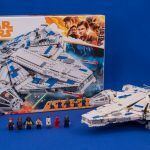 75212 Kessel Run Millennium Falcon includes six minifigures and one brick-built droid — Han Solo, Chewbacca, Qi’ra, Lando Calrissian, Quay Tolsite, and a Kessel Operations Droid, plus a DD-BD droid. 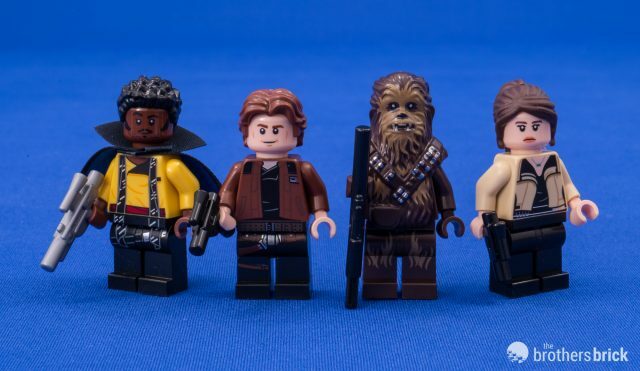 Each of these characters’ designs are unique to this set. 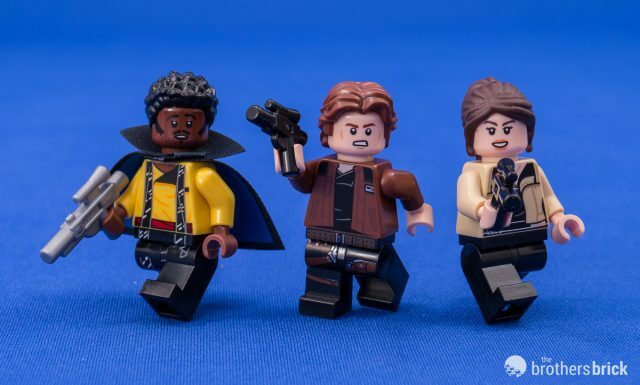 Lando, Qi’ra, and Han all have reversible heads, with a calm/smiling expression on one side and an angry/concerned expression on the other. Qi’ra’s hairpiece is from the Friends line and is rubber with a hair accessory hole at the top. 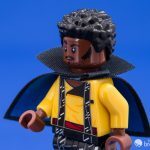 Lando, always a suave figure, has a fashionable cape that’s two-toned with a black exterior and a blue interior with black fringing. 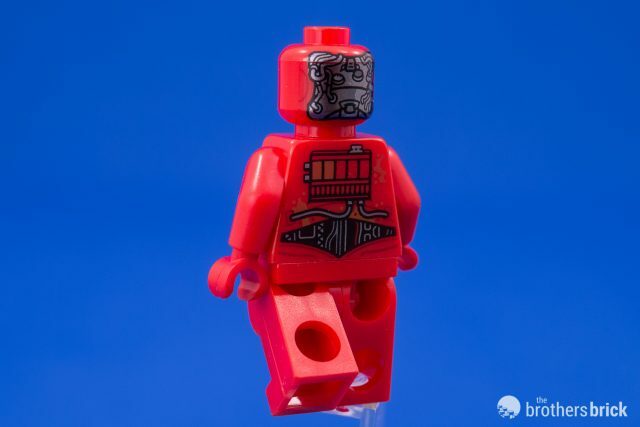 His bright orange torso shows his black tie/scarf/sash with white slashes that extends onto the legs. 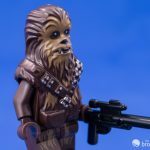 Chewbacca gets a completely new design, primarily to accomodate the different style of bandoleer, which now straps over both shoulders. He’s also got a small box at his waistline. 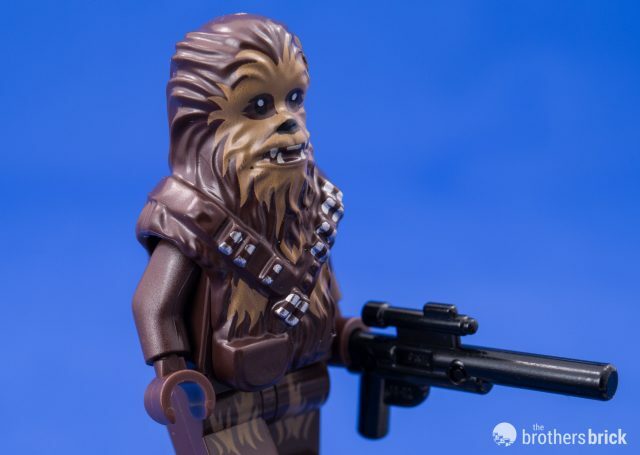 He carries a heavy blaster rifle instead of his customary bowcaster. 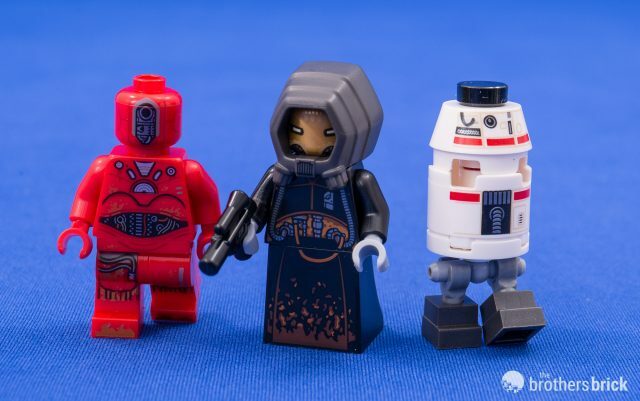 Three all-new characters are the Kessel Operations Droid, Quay Tolsite, and DD-BD. 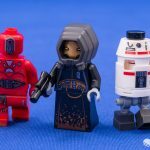 The Kessel droid is cyborg version of a humanoid droid like C-3PO. 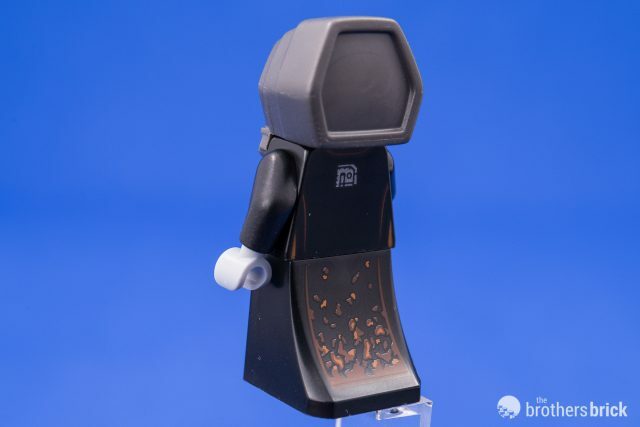 His head is much narrower than the bulbous minifigure head would have him appear, but short of a new sculpted element, the minifigure head is more accurate than C-3PO’s head would be. 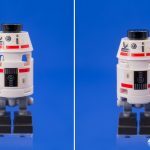 From the back, the Kessel Operations Droid has more exposed machinery on both the head and torso. 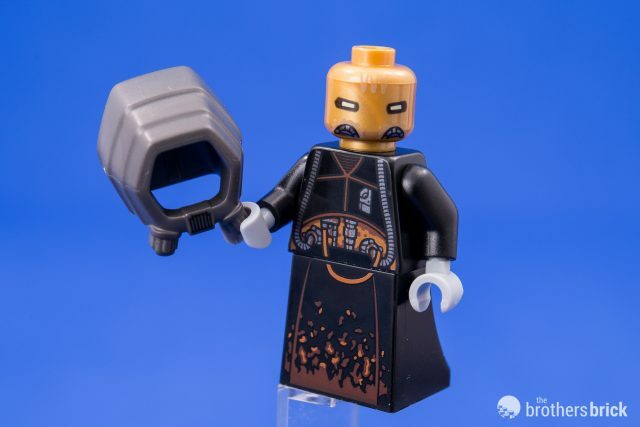 Quay Tolsite has a black torso with a pearl gold head, and wears a new piece of headgear that has a hexagonal form. 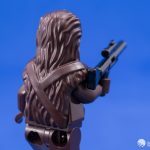 We could speculate more about this character, but we’ll forego it in the interest of not further spoiling the film for ourselves or our readers. 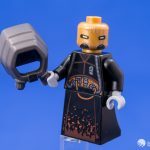 Quay is the second character we’ve reviewed to employ the new dress legpiece (the first was Moloch), which finally updates LEGO’s long tradition of using a 2x2x2 slope brick for a skirt. At five plates tall, this skirt piece is the same height as legs, and has the larger studs on the top identical to legs. 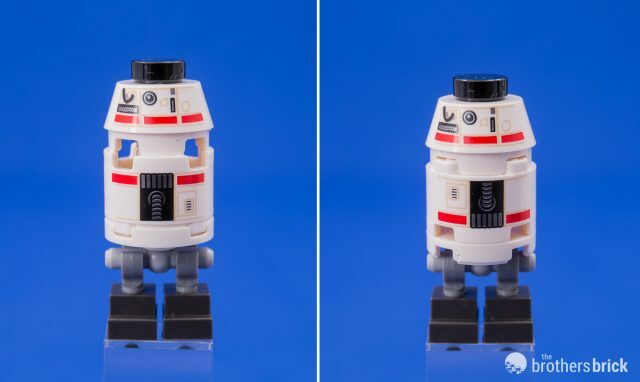 Finally, there’s DD-BD, who is an astromech droid who walks on two stubby legs — basically a cross between R5-D4 and a Gonk droid. One thing we noticed immediately is the huge gaps below the head caused by the inverted construction of the body. In the version on the right, we simply turned the body back upright, which we think looks signicantly better. 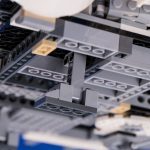 It could be improved even further by using a regular 2×2 round plate that the bottom instead of the 2×2 round tile with stud, but we wanted to stick to only the pieces already found in the droid. 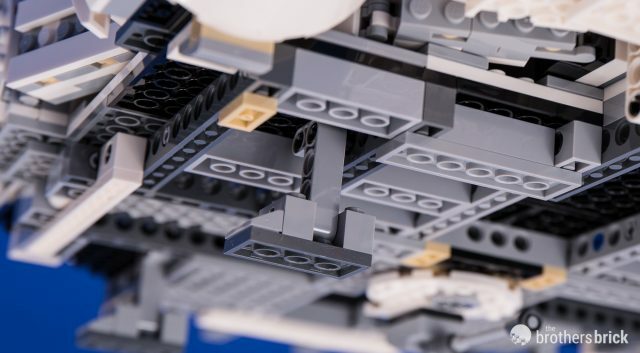 We’re not sure why LEGO designers chose the method on the left, because our version seems just as sturdy, and uses one fewer piece (the 2-long Technic axle holding the head on is no longer necessary). 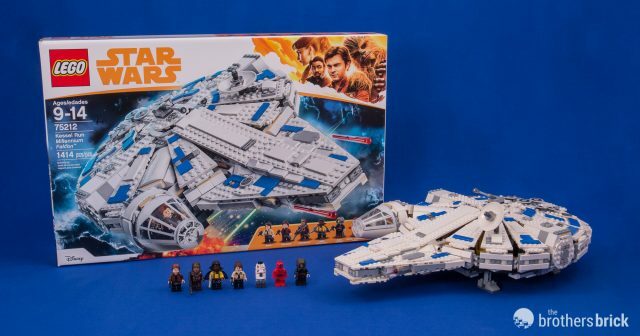 Like 75210 Moloch’s Landspeeder, this is another set from Solo that I feel I need to withhold judgment on. 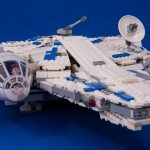 I fell in love with 75209 Han Solo’s Landspeeder thanks to its great design and play features, but there really aren’t any interesting differences from previous LEGO Falcons or major new play features (other than the front pod) that make this factory-new Falcon exciting on its own, without seeing the movie next month. 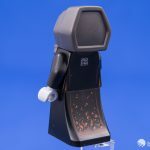 And at $170 for 1,400 pieces, it’s not the screaming deal that some of the other sets based on Anthology movies (Rogue One sets were also a great value) have been. 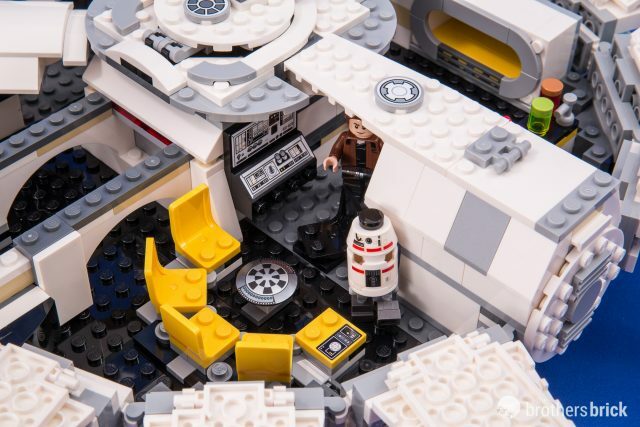 Sure, you get a lot of white tiles for the outer hull, but the interior is the same black and gray that we all have buckets of from other Star Wars sets. Therefore, it’s not a great parts pack, either. 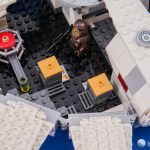 While the set does feel necessary as part of the wave of LEGO Star Wars sets released in support of the movie, actually purchasing it doesn’t feel nearly as necessary. 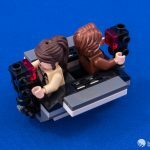 My opinion may change when I see the movie — I may love Ron Howard’s take on the Star Wars universe as much as I loved Rogue One — but without the added motivation from liking the movie, it’s hard to recommend this LEGO set on its own merits. 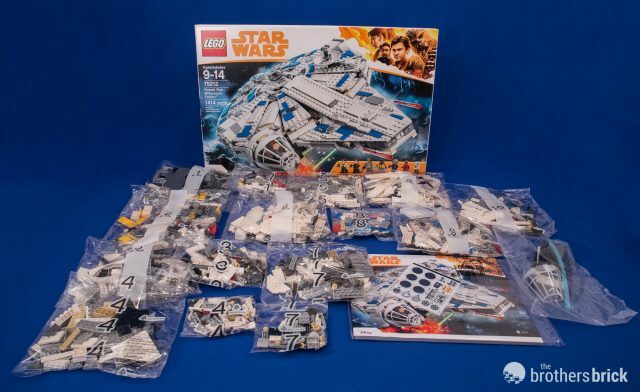 75212 Kessel Run Millennium Falcon includes 1,414 pieces with six minifigures and a droid. 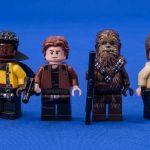 This new set is available now from the LEGO Shop ($169.99 in the US | £149.99 in the UK | $199.99 in Canada), Target, eBay, and BrickLink. 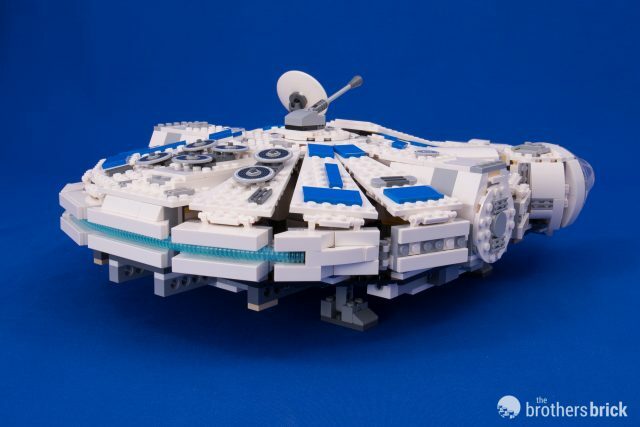 Thanks for this very good and clear review of the newest version of the Millennium Falcon. 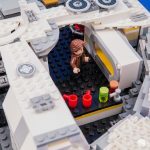 What i like most about its design is the sleeping berth, but apart from that… it just looks like a recolored copy/paste from the previous two or three earlier releases of the Millennium Falcon (which I already own), and I feel I can’t get into yet another SW spin-off series of sets: I just don’t have the space anymore. 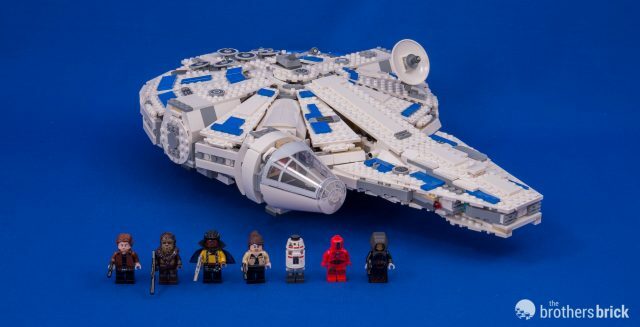 In fact, I only recently tore down my 4505 Millennium Falcon due to also having the 75105 MF on display, and I’ve got a MISB 7965 MF stashed away as well somewhere. 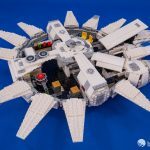 It’s fun to finally have an imagining of the cargo pod but apart from the novelty of seeing it, it’s hardly a worthwhile addition to the vessel. 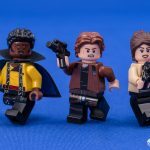 I wonder if the cargo piece will be the cargo Han dumps that gets him on Jabba’s list? 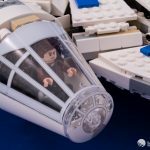 It still surprises me, that they had enough space to fit an espresso machine behind Han in the cockpit. 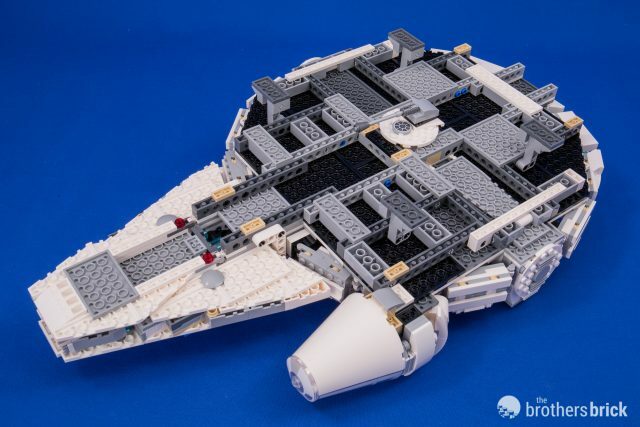 I really don’t care for the shaping of this ship (Same as that older one). 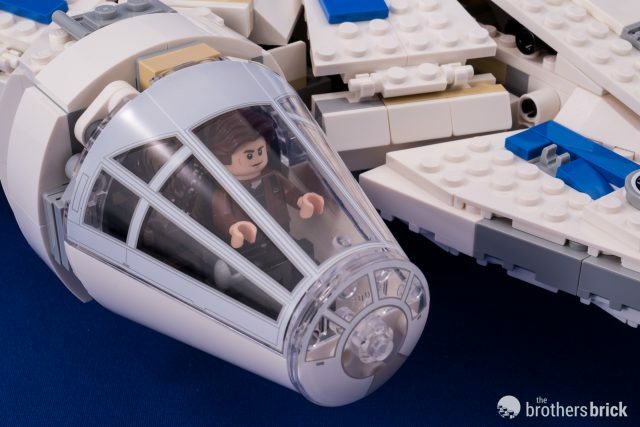 The tiny mandibles are very glaringly off-model, but what’s truly always baffled me is the decision to have tiny cockpits that can barely even hold a couple of minifigs. 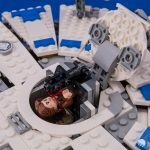 They should beef up the proportion of the cockpits! 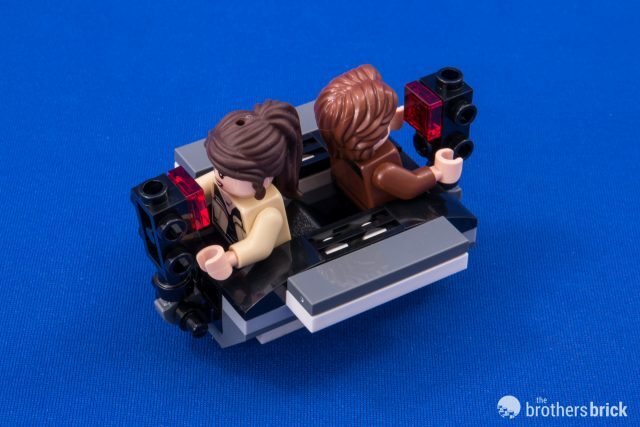 Minifigs don’t have normal proportions, so vehicle designs should be altered to accommodate them accordingly — flatter and wider than “realistic” proportions would be great, but instead proportions nearly always trend the opposite direction (Where they’re so tiny and cramped that they still throw off the proportions of the overall design). 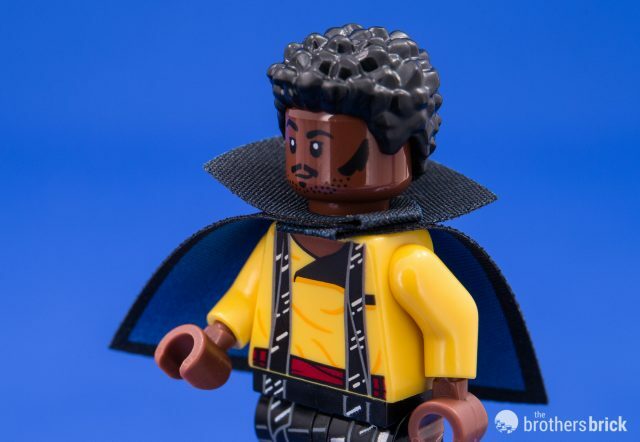 I went ahead and ordered this because I missed the last retail level falcon.